Diplomacy is a round-based strategy game with simple rules but a real-time component as players move in parallel. It also emphasizes negotiation between players, which is difficult to realize in a bot but essential to achieve a human-like playing style. In a previous work, we found that in Turing Tests, players mainly use three usual shortcomings of current bot implementations to identify them as computer players, a certain level of playing strength which makes planning necessary, the avoidance of mistakes, that is moves a human most likely would not use, and a meaningful communication. According to previous results, it seems to be especially hard to combine well-playing with a human-like move style. While the communication problem has already been treated successfully at least for short games, currently known CI-based bots do not plan ahead. We present a planning Diplomacy bot which employs the negotiation kernel of an already existing bot and apply our believability measure technique in a new and interesting way. Instead of learning how to minimize the number of bad moves according to a mixture of games of several players—this had proved difficult as different players regard different moves as bad or computer-like—we go a step into the direction of mimicking human player styles by using only saved games of one person each. We thus effectively create a bot which is playing well, including planning, uses basic communication and partly inherits the playing style of a specific human player. 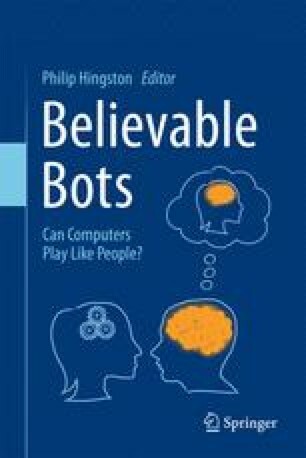 The different obtained bots are compared according to playing strength and believability.